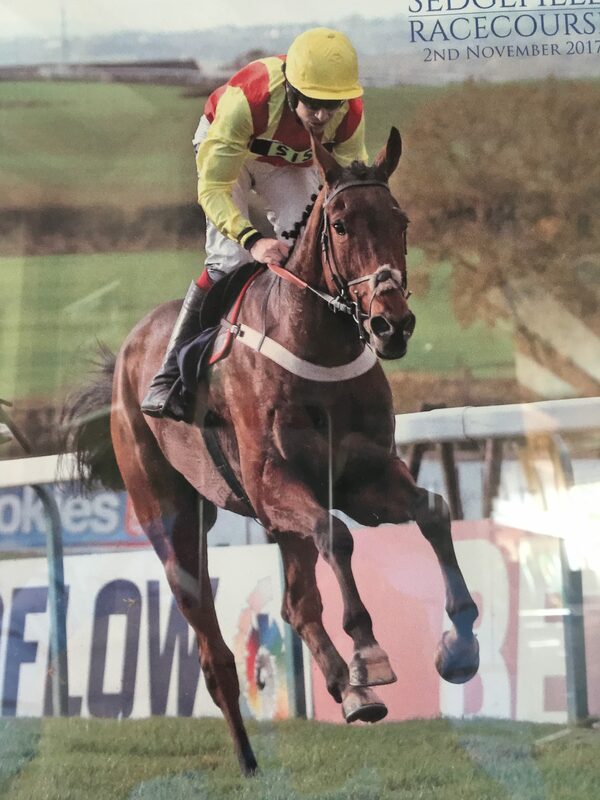 We have had a very exciting week with The Happy Chappy winning at Sedgefield. This was his second chase start and his first handicap chase, and although there were only four runners, it was a very tight, competitive race. Aidan Coleman gave him a lovely ride and was very excited about him afterwards. Chappy’s jumping was superb throughout and Aidan said you won’t find a better jumper. He also said that Chappy could do with a stiffer test and even further in time. The Grand National in two years time perhaps? It was lovely to have a win at the start of the ‘proper’ national hunt season, and many congratulations to the team at home who work so hard to prepare the horses and look after them so well. This week coming should see us have a couple of more runners. Highway Star will be entered in a bumper at Fontwell and Sandown. He is quite a complicated character, but if he can control his nerves he should run well. He has an enormous engine and lots of ability, but just needs to learn how to put it all together. Postbridge is also entered at Fontwell on Friday. I put her into a mares only chase and a hurdle race, but if you look at the chase, it looks like a Cheltenham final so we’ll stick to hurdling there. She has been schooling very well and settling so it will be interesting to see if she can take that to the track. Hopefully Jack Quinlan will be available to take the ride on both of them. All of the horses have been doing plenty of schooling this week. Louis P and TJ have begun to work in town which they find very interesting. They can both give Graham quite a hard time! We will probably try to take them for a racecourse gallop sometime before Christmas and certainly before their first run. Legend To Be added another bow to his string and to his CV by going team chasing this weekend. Nick rode him and loved it. The team had three clears, but the results were not available when they came home, so we wait to see where they ended up. Legend only needs to do a dressage test and play polo and he then has turned his hoof to everything. He’s a brilliant advert for thoroughbreds and ex-racehorses.